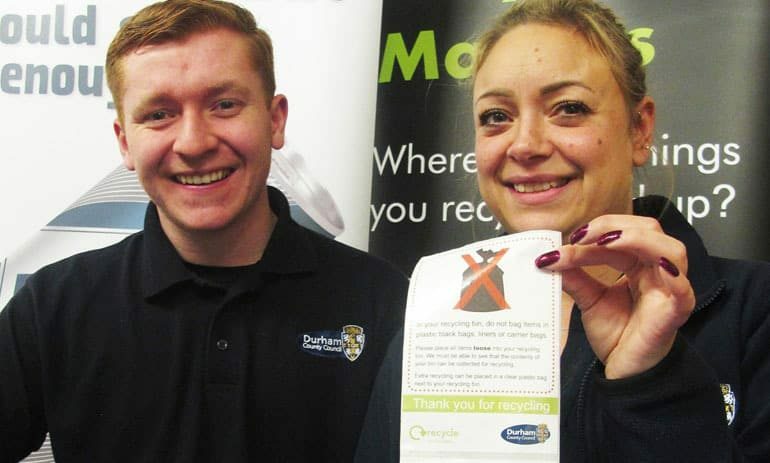 Residents are being reminded not to place items in black bags when they fill their recycling bins and boxes as part of a campaign to reduce contamination. Durham County Council’s Recycling Matters campaign aims to educate residents about what can and cannot be recycled. One mistake people can sometimes make when recycling is putting items within black bin liners. It may seem like a clean and organised approach but it prevents crews and sorters at recycling plants from seeing what is inside. This makes the process more time consuming, as the bags need to be opened, costly and potentially dangerous if sharp objects are included. To help raise awareness, the authority has arranged for new ‘no black bag’ stickers to be attached to all recycling bins in County Durham in the new year. Oliver Sherratt, head of direct services at Durham County Council, said: “Eighty-five per cent of household recycling collected in County Durham can be reprocessed into new materials, which is fantastic and we would like to thank residents for their support. “However, this means that 15 per cent of what we collect can’t be recycled and should not have been included in that bin. Black bin liners are a good example, as not only can we not recycle them, but our crews cannot see what is inside. “It may be good recyclable materials or contaminations, such as food waste or nappies, but sometimes black bags and their contents are discarded at recycling plants, especially during busy times. Residents are encouraged to place plastic pots, tubs, trays and bottles in their blue bins, along with cans, aerosols, foil, paper and cardboard. Glass bottles and jars should go into the recycling box. All objects should be clean and dry, and any excess recycling should be placed in a clear plastic bag next to the recycling bin. Recycling properly not only helps the environment -with every recycled can saving enough energy to run a television for four hours – but it is also financially rewarding. In fact, it costs Durham County Council three times more to dispose of general household waste than recycling. However, if contamination levels get too high, the authority could receive financial penalties that can run into thousands of pounds.